Potting Shed Creations Pocket Garden's are a fantastic gift for the wine lover or herbal tea enthusiast in your life. These little gardens are perfect for the yard, containers or window boxes. Each kit comes with five varieties of seed, seedling markers, and a detailed fold-out booklet that provides growing information and tasty recipes. 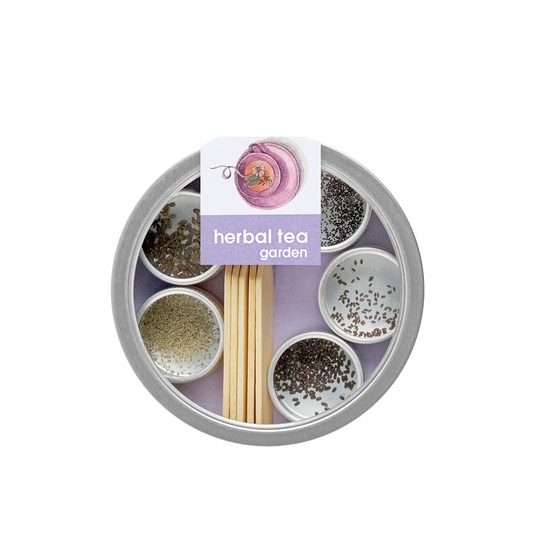 The Herbal Tea Pocket Garden contains: lavender, anise, German chamomile, peppermint, and wild bergamot. We especially love the tea infusion directions! The Organic Culinary Herbs for Wine Lovers includes: Greek oregano, basil bouquet, English thyme, Italian parsley, summer savory. A collection of culinary herbs carefully chosen to compliment your culinary skills and fine wine selections. Helpful hints, guidelines, and suggested pairings are included to make the experience from planting to harvesting fun! Clink! Cheers! circle tin: 4" x 1.25"
Size - circle tin: 4" x 1.25"